Too many bankers neglect LinkedIn. Compared to other top sales professionals, who log on for about 120 minutes daily, the average banker is on LinkedIn just 17 minutes per month. According to Jack Hubbard, Chief Experience Officer at St. Meyer & Hubbard, that has to change. LinkedIn started in 2003 as a recruitment tool, but today it’s much more than that. True, it might be where you land your next job — but it’s also where the sales process begins. With 467 million LinkedIn users worldwide, it's no wonder most marketers view LinkedIn as an effective source for generating leads. 1. Establish a LinkedIn philosophy. While financial institutions lump LinkedIn in with other social media channels that need to be restricted, Hubbard doesn't believe LinkedIn is a social media channel. He describes it as a social education and collaboration tool, as well as an effective source for generating leads. Establish a LinkedIn philosophy. Successful LinkedIn users have carefully examined why they are using LinkedIn to build their business, so that they can make guided decisions in how they leverage the platform to add value and build trust among current and potential customers. 2. Add a photo and make sure it's a good one. The headline opposite your photo is valuable real estate. Don’t waste your allotted 120 characters with your title or where you work. Those details are found in the heading listed just below your name. Instead, make it something that gets people’s attention fast, like “Banker in charge of getting things done in Nashville.” It’s also important to remember that when someone hovers over your name, they only see the first 80 characters, so make those the most compelling. 4. Write a summary people will remember. No one cares if you’re the biggest producer in the bank or that you have a $50 million portfolio. What customers want to know is how you will help them, and what separates you from all the other bankers out there. Write your summary based on this information. With a 2,000 character limit (about 500 words), you can expand on your headline and focus on establishing your personal brand. Write your own summary if you’re a good writer, or ask the marketing department, if that is available to you. If not, pay a professional to write the summary. It’s worth the investment. Now that you have a professional photo, a strong headline, and a summary focused on how you can help your customers, its time to connect. Develop a criteria for who you will and won’t connect with, and send them a personalized connection invitation. Resist the temptation to connect with someone when you’re on a tablet or smart phone because you can’t personalize the message. Afterwards, thank them for connecting. Offer your assistance as a resource on a need they might have. Whatever you do, don’t sell. This is a tool to build your brand, find the right people to connect with, and build relationships. 6. Be a Groupie and Follow the Leaders. There are 3.5 million LinkedIn groups you can join. If you’re not in one, find at least three. Get in a financial services group, such as Social Selling for Bankers. You might want to join a few groups to align with industries you target. Ask questions, share ideas, and engage with others. Though it’s tempting to join as many groups as LinkedIn allows, being an effective groupie depends on participation. Don’t join for the badges in your profile; join to participate and learn. In addition to groups, start following people you respect in the industry. Tony Hughes and Don Peppers have a lot of advice and insight for financial professionals. As for companies, start following your clients, top prospects and competitors. You can snag earnings info, learn about new company hires and other important information. 7. Share and publish content. Post one article a day. Connect with 3 people a day. Find 3 articles you can share through the day from people you follow. Better yet, write your own article and publish it on the platform. Dedicated LinkedIn social sellers post once a month. After you attend a conference or training, see if you can find 3 things you learned that your network might find interesting. Answer the question ‘What did I learn from this?’ For example, Hubbard returned from a recent conference and wrote about how executives can boost their Return on Learning Investment, or ROLI, when they get back to the office. While you shouldn’t be connecting on a smartphone or tablet, that’s where it makes sense to use LinkedIn Pulse, the platform’s content engine, to learn about and share topics relevant to your network. You can also save articles to read at a later date. If you wrote that post-conference article mentioned above, it might end up posted in Pulse. 9. Don't neglect your company homepage. Your financial institution should have a LinkedIn homepage to share articles and publications. It enhances both you and your company's reputation as a thought leader. 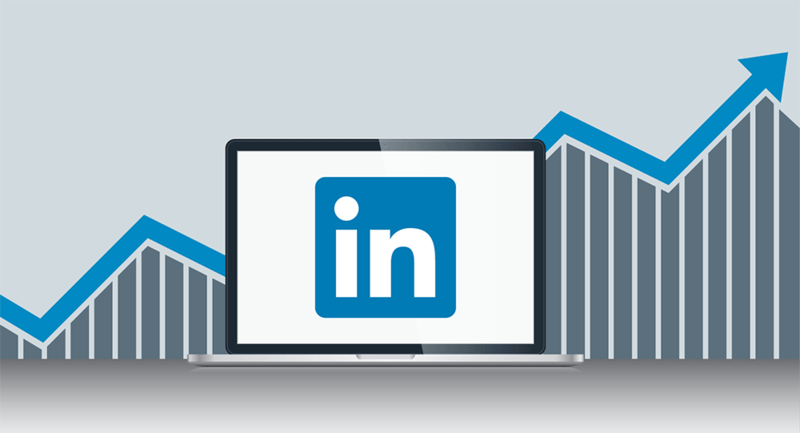 LinkedIn users are 82% more likely to go to your LinkedIn homepage than to your company website after connecting. 10. Spend some money. Explore LinkedIn levels. The Basic LinkedIn engagement level comes with greater restrictions that make it less effective but if you’re not on LinkedIn yet, start here. Sales Navigator also has a social selling index that allows you to chart your power as a social selling expert. The average financial services person has a SSI # of 19 on a scale of 0-100. The top 10% of Sales Navigator users have a score of 80 or above. 10.5: What about the competition? You can change your privacy settings so that only you can see your connections, but don’t let the idea of your competition poaching your clients push you away from LinkedIn completely. As Hubbard says, if you’re worried about the competition stealing your clients at the click of a button, you have a bigger problem than LinkedIn. It takes time to learn how to use LinkedIn effectively, but it is well worth the investment. Hubbard has more ways to help your financial institution maximize LinkedIn as an education and value tool. Follow Jack (on LinkedIn, of course) and read more about how he can help your financial institution here.